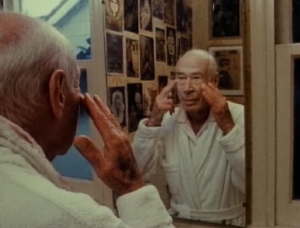 Love him or hate him, this half-hour documentary of the writer Henry Miller, filmed at aged 81, is a gem. Firstly it proves one of the great mysteries of maledom – the bathroom is the place to think. It also illustrates the ultimate inspiration board – the walls of his bathroom are a stunning gallery of ideas. In this film from 1975, his bathroom reveals his fascination from Japanese films and Hieronymus Bosch, to Jung, Russian kings and Buddhas, along with a placard revealing “even nice people get syphilis”. He generously explains the lot, and while they are seemingly disparate images they all seem to line up with the famous title of Gauguin’s painting, which a copy of sits above the commode in his bathroom – the busiest and most important spot I imagine – “Who are we? Where are we going? Why are we here?”. Good questions. 34 minutes, film hosted on Snagfilms’ web site.